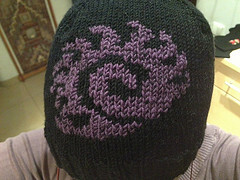 And here is the hat I knit for myself. I love how it turned out and it matches my green winter coat perfectly. Knitting it was quite a challenge, but after a few mistakes everything went smoothly and I just love how fancy the pattern looks. 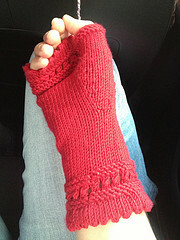 To match the hat, I worked a pair of really lovely red mittens with the same yarn. The pattern is simply great and the mittens are supereasy and fast to do… and they look just awesome. It’s a bit hard to see in the pic, but there are actually cute leaves all over the skirt of the dress and the edging is crocheted white lace. 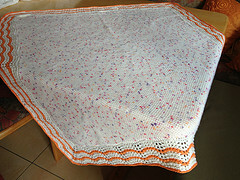 And for the other baby in my family, which is due in a couple of weeks, I knit a blanket. 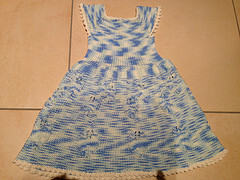 The pattern is from rav., but I modified it quite a bit. 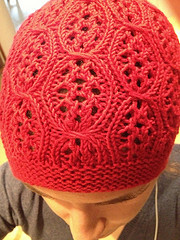 For one I used a thinner yarn and smaller needles. The main part of the blanket is also quite different. I started by casting on 1 stitch and then increasing by knitting front to back (kfb) into the second stitch in every row. This creates a lovely garter stitch blanket. 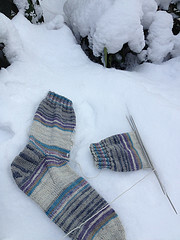 And finally here is the project I’m working on at the moment… just a pair of simple socks for one of my uncles.